Terry Anderson has been busy in the last few months with two projects outside of the Studio that we thought we’d mention here. First is Drawn Out, his recently concluded series of podcast interviews on the topic of cartooning with a range of talented people either from or based in Scotland. Featured guests include academic Hattie Kennedy; animators Will Anderson and Davey Ferguson (aka Swatpaz); children’s book illustrator Moira Munro; conceptual & storyboard artist Rob McCallum; graphic novelists Colin Bell & Neil Florence, John Chalmers & Sandra Marrs (aka Metaphrog), Kate Charlesworth and Gill Hatcher; political cartoonists Lorna Miller and Greg Moodie; street artist & designer Conzo Throb; and finally, comicbook superstar Frank Quietly. All the episodes are available via the Drawn Out website as well as iTunes, Stitcher and all other podcast apps. 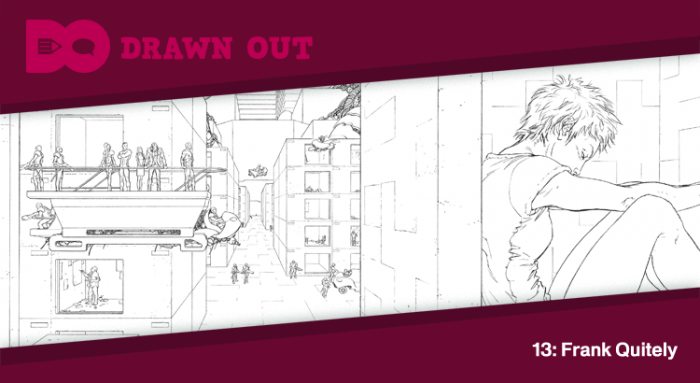 Drawn Out is a Heard Yet Media production. Secondly Terry is now on the board of Cartoonists Rights Network International, the human rights organisation for cartoonists whose life, liberty of livelihood are threatened because of their work. You can find out more via Terry’s personal site and get the latest information about CRNI’s work in defence of freedom of expression on their news page. Terry is the organisation’s representative for Northern Europe so any cartoonist in that region affected by these issues and in need of help should feel free to email him directly at his CRNI address.